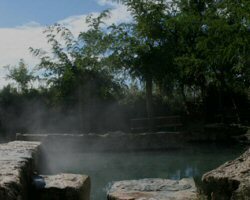 The "Bagno Grande" (greath bath) is easily reachable by foot from the main square of San Casciano, passing by a peaceful wood equipped with an exercise path for fitness lovers. Casa Teatro Casa Teatro is an extremely comfortable house with a most welcoming atmosphere. On Ghino di Tacco's paths... Country horseback riding with il Poggio.